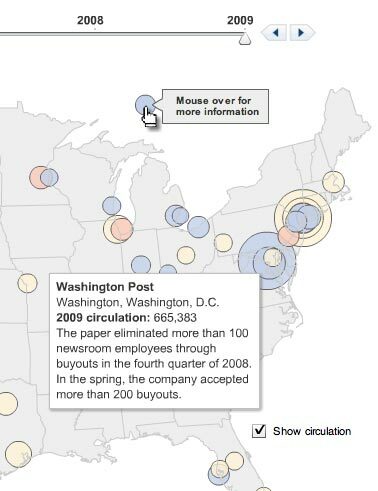 The Wall Street Journal has created an interactive map of the US to track events and readership figures for the US’ top 50 newspapers (by circulation). The map shows staff reductions, sales of titles and moves to online-only editions and covers the period from 2006 onwards. This entry was posted in Editors' pick, Newspapers and tagged The Wall Street Journal, United States, us on September 8, 2009 by Laura Oliver.